I don’t make risotto nearly as much as I should. I never order it in a restaurant unless I’m absolutely sure they’re going to do it right because there’s nothing worse than a not-very-good risotto. But there’s nothing better than a good one. Especially a good one with bacon in it. One night, back when I was working at Chez Panisse, Paul Bertolli, one of the world’s great cooks (Italian, and otherwise), was standing over the stove, tending to steamy pots of risotto for diners. So I go over to him and ask him for a lesson. And he was happy to teach me. As he presided over several pots of barely simmering rice, I got a few pointers from him. The first tip he said was to use turkey stock if you can, which he said was more flavorful than chicken stock. The second tip was, as you go, to add more stock only when there was just a thin layer, ¼ inch (1cm), of starchy, cloudy liquid floating on the surface of the rice. Risotto is an emulsion, and like any emulsion, you try not to break them during cooking. So add the stock as studiously as possible. Lastly, when you stir the rice, make sure to knock any rice grains off the stirring utensil, back into the pot. Same with any rice grains sticking to the side of the pot after stirring. Knock ’em off! Those errant grains won’t cook at the same rate as the rice in the pot so you’ll have some uneven grains of rice in your risotto when it’s finished. We never talked about what kind of rice to use, but most Italians have told me that carnaroli rice is better for risotto than arborio, so that’s what I use. It’s said to be starchier, resulting in a richer dish. I don’t argue with Italians so you can use either. And perhaps I might get in trouble for going rogue, but I sometimes use pecorino or asiago in risotto, which may or may not be authentic, but sometimes it’s hard to cook with the authenticity police peering over your shoulder. And let’s face it, if you’re going to eat it, then you can do what you want. Here I used some gorgeous red chicory that one of the producteurs (producers) has been selling at the market. I first thought it was radicchio, but it’s less bitter. I don’t mind bitterness. In fact, bitter greens go well in risotto, a nice contrast with the starchiness of the rice and the richly reduced stock. So I make it with either. To me, a bowl of risotto is a complete meal, although you know you’re in France when guests look around the table, and ask for the bread to go with the rice. And darn if my guests didn’t use the bread (which I’ve learned to have, just in case…) to sop up the rice. 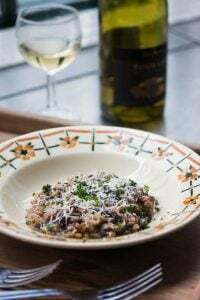 But traditionally risotto is served in a mound in the center of the bowl, meant to be eaten from the outside – where it’s cooler – keeping the thicker center warm, until you get there. The best accompaniment is a bottle of nice white wine, some Italian cheese to grate over the top, and, depending on where you’re from, perhaps some bread. Because the bacon, the stock, and the cheese all have salt in them, use a light hand with it when seasoning the rice and shallots. You can swap out another green in place of the radicchio. I recommend something strongly flavored, such as kale, mustard greens, or arugula. I had some leftover duck meat from another project, so feel free to add some if you want to make the risotto feel more like a main course.For a vegetarian version, leave out the bacon and add about 1 1/2 cups (200g) sautéed mushrooms, bite-sized pieces of steamed or oven-roasted asparagus, or peas, and use vegetable stock. 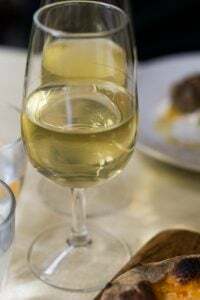 If you don’t drink alcohol, omit the white wine and add a squeeze of lemon juice at the beginning, with the first addition of stock, to add a touch of acidity. 1. 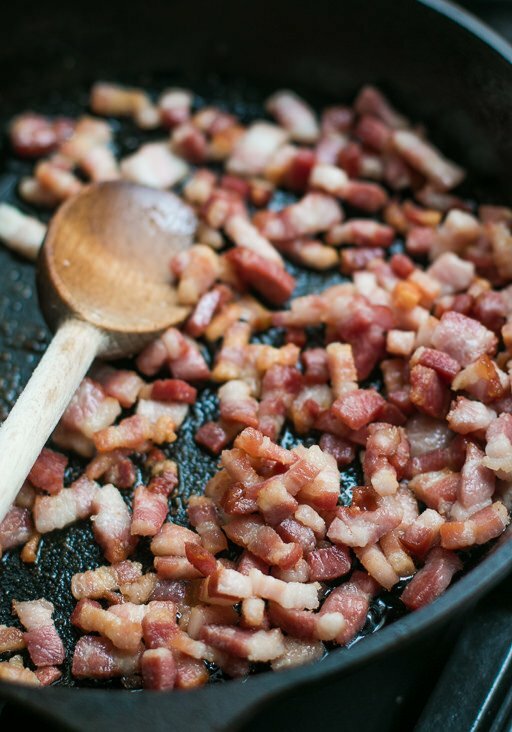 In a wide saucepan, fry the bacon over moderate heat until just crisp on the outside, but not overcooked. 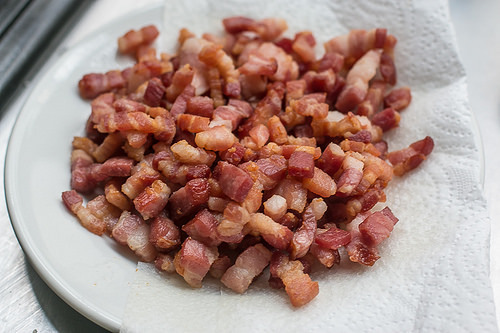 Remove the bacon bits with a slotted spoon and drain on paper towels. 2. Wipe excess bacon fat from the pan add the radicchio, seasoning it lightly with salt and pepper. Cover, and cook, stirring a few times while it’s cooking, until wilted, about 5 minutes. Remove from heat, uncover, and let come to room temperature. Once cool enough to handle, chop the radicchio into bite-size pieces, and set aside. 3. Heat the stock in a saucepan and keep it warm while you make the risotto. 4. 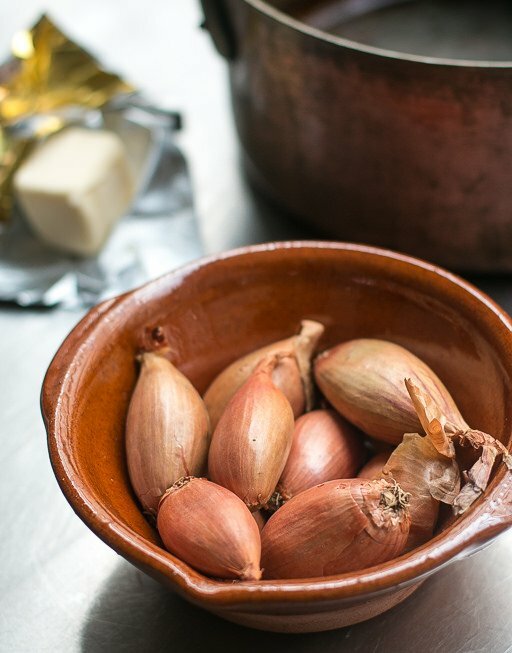 Melt the 2 tablespoons of butter in the wide saucepan and add the shallots. Cook, stirring constantly until translucent. Add the rice and cook another minute, stirring. Add the wine and continue to cook until the wine is completely absorbed by the rice. 5. Using a ladle, add enough of the warm stock to cover the rice, enough so there is about 1/4-inch (1cm) liquid above the rice. Continue to cook at a gentle simmer, stirring frequently, adding more warm stock as you go, making sure there is no more than 1/2-inch (1cm) of liquid on the surface. 6. When you’ve added almost all but the last few ladlesful of the stock, stir in the thyme, bacon, and radicchio. 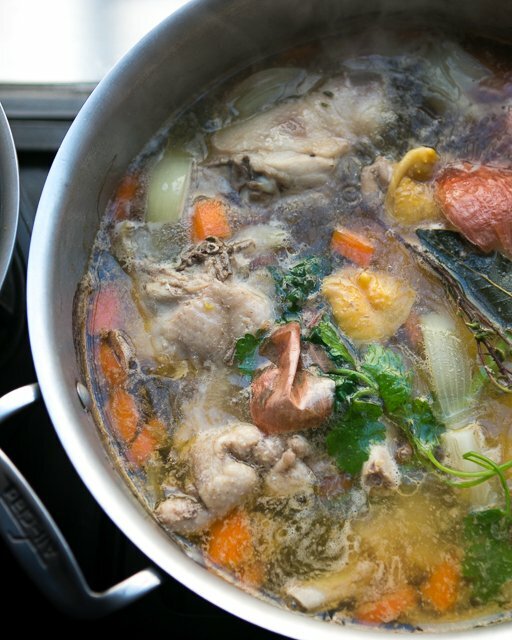 Continue cooking, adding the rest of the stock (and the chicken or duck, if using), until all the liquid has been added. It’s done when you taste a few grains of rice, and they are cooked through. If not, continue cooking, adding a bit of hot water or more stock if you have it, until it’s the right consistency. Serve in warm bowls, with additional grated cheese on top. 7. Stir in the additional tablespoon of butter and the grated cheese. Remove the risotto from the heat, cover, and let stand a few minutes before serving. As an avid reader of your blog, it was a great surprise to see you talking about risotto (probably my favorite thing to eat and cook). I’ve always used chicken stock but now I’m curious about this turkey stock. Can you please share exactly how you did it? I was wondering what herbs have you used and so on! I once saw a tv chef making risotto with pre-cooked, or at least par-cooked, rice in a restaurant setting. I can’t imagine that developing the creamy texture of slow cooked risotto and I wondered if that was common in restaurants. Mathilde: You just use turkey bones in place of chicken. I don’t use a lot of herbs in stock – mostly parsley with some thyme and a bay leaf or two. 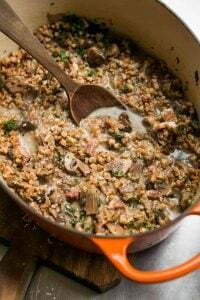 Your take on Risotto looks naturally flavorsome.I will have use turkey stock next time in my batch love making turkey broths all the time but I have though it would work in risotto. I have never seen risotto being made in restaurants but I have heard there are varieties if rice which allow the gluten to release more easily, so creamy risotto is no problem even without stiring. I’ve had about all I can take. You look at that 4th photo down. How in the world do you expect anyone to look at that and not want to jump in that pot of deliciousness and go swimming…mouth wide open with every stroke? And now I’m supposed to eat a bowl of oatmeal for breakfast? It looks amazing!!! You know, I totally understand your comment about the authenticity police… It really upsets me every time someone (usually the same people) complain about having certain ingredients together, and deviations from the traditional forms in a particular dish. I’ve lived in 3 different countries by now, and I’ve met and eaten with people from all over the world. What may seem “crazy” to someone may actually be quite common to someone else. Let’s enjoy and judge based on flavors, not on preconceived notions!!! I’m down with some things remaining as true to the original as possible, like Caesar salad and Salade Niçoise, but foods, tastes, and availability changes over time. Many people say that you must use Tarbais beans to make cassoulet, because they are from the region where cassoulet is from. But some say that originally, cassoulet was made from fava beans. And I’m not a food anthropologist, but it’s believed that originally, Thai cuisine didn’t have chiles. 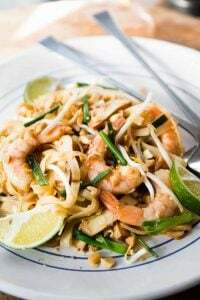 I’ve not researched that one, but it’s interesting how if true, that’s evolved to what we know of Thai cuisine today. 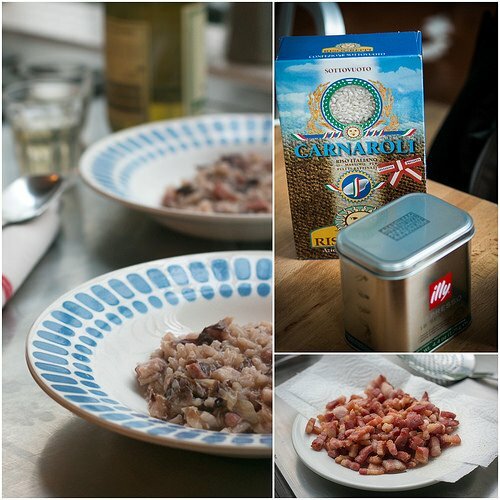 Carnaroli vs Arborio – turkey stock vs chicken; if you’re into risotto you should try it all. 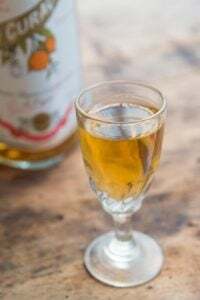 This particular recipe is very interesting (no doubt more flavorful), and you can always count on David for up to date variations. However you look at it, risotto is comfort food, whether an entree or side dish. I’ve used duck stock which works great, too. The only thing that is pretty imperative for risotto (in my opinion…) is that the stock really needs to be homemade. People got out of the habit of making stock, at least in the US, because canned and boxed stocks became so available – and so convenient. But I always make stock when I make risotto. That looks wonderful. I’m sure the authenticity police would be appalled by this, but I make risotto in my pressure cooker. The results are creamy and totally delicious and easy beyond belief. No matter how slowly I go with risotto I find that it’s never as rich as what I get at restaurants. I always wonder if restaurants secretly add some cream or extra butter to their risottos but I guess I will just try to be more generous with the cheese and try this carnaroli rice. 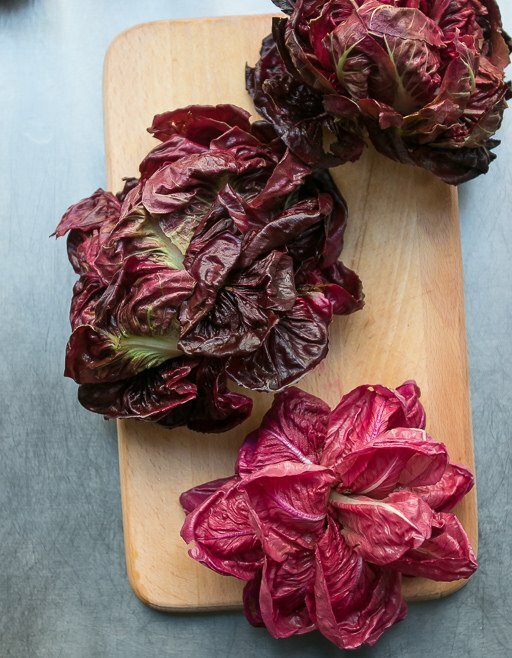 I’m not a fan of radicchio but I can see how well it would fit into this recipe! I LOVE risotto…make it at least once a week! I also add in pancetta quite often…either peas and mushrooms or with shrimp! Mmmmm….risotto! But that stock pot of turkey broth brewing looks just as inviting. Can you do a bit on stock basics soon? PS Love your photography, David! Hmmm….I’ve got duck stock, bacon, radicchio, shallots and carnaroli on hand. Guess what’s for dinner? If you had some duck meat on hand (as I do) when would you add it? Actually, when I find a fat hen in the market that’s my cue for the risotto. It’s makes the best stock ever. Never boil, just simmer. Day 1: Serve up a poule au pot using the dark meat and the vegetables, adding fresh ones if need be. Day 2: Risotto with the hen stock. Day 3: whip up a chicken pie with the rest of the chicken meat and stock The white gets pretty dry so it needs the creaminess of a bechamel. And there’s your week! 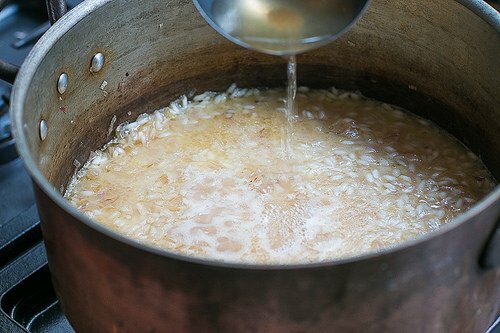 Is there an approximate cooking time from when the first ladle of stock is added until the rice is cooked? Also, when cooking in the stock, is the mixture boiling, simmering, or should the entire dish be cooked under “moderate heat” like the bacon and shallots? Bless You! Thank you for that. Whenever I read about risotto, I chuckle, because I immediately think back to Tom Colicchio’s disdain on Top Chef for anyone who cannot cook risotto, which is basically everyone on the show. Whenever I’ve made it at home, I’ve always enjoyed it and I’m definitely no pro. I like the idea of the radicchio here. I’m awaiting my copy of the Paris book daily but it takes a while to arrive – maybe tomorrow?! We were planning on Risotto tonight before I saw your recipe. It reminded me that we have some pretty good turkey stock in the freezer. So turkey stock it is for tonight. Chili, Maize, Potato, Dry White and Red Beans, Tomato, Avocado, not to mention the Turkey, all came from the Americas and only appear in European and Asian cooking after 1500. Radicchio and turkey stock photos are amazing, and details on the carnaroli rice, and even cooking are appreciated. There is nothing worse than uneven grains! I can’t wait to make this!! David, I am calling Central Market Houston daily in search your latest book but to no avail. I will be at Central Mkt on April 24 for your book signing. How will I ever be able to locate your book. Feeling desperate here in Texas. You guys should try risotto made with ham stock, from the post-Easter ham! Ease up on the bacon (or not), or dilute the ham stock a little because it can be salty. Best risotto I ever made was with lobster stock, asparagus and mushrooms. The risotto looks divine but the photo of your wedge shaped wooden spatula was a stab to my heart. It’s such a perfect shape and I apparently had the only left handed version in existence until my lab pup destroyed it. I found it 20 years ago while on vacation in England and used it constantly. 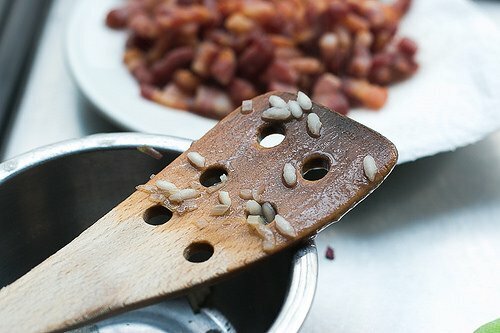 I’m going to make this ultimate bacon-y comfort food, stir it with an inadequate utensil, complain bitterly of my loss, savor every bite including the duck meat which will put it over the top and not share a single grain with you-know-who. Thank you for all your great posts. I’m on wait lists for your Seattle book tour stops. Enjoy our city. Thank you for the great advice on the fine art of Risotto making. Call me old school but I wish you had a print function on your recipies. I think I would cook them more often if you did. However, I guess what I really need to do is run right out and buy your new book. It looks beautiful. Congratulations! Thanks for the brilliant tip about the turkey stock. I always several containers frozen in the freezer after I make a big batch from the Thanksgiving turkey, and I don’t usually use it up too quickly because I reach for my stores of chicken and beef stock more often. So I’m happy to have another good way to use it… so much good flavor, and I never would have thought of it. And I love the bit about knocking the uncooked rice off your spoon… it’s the little things! The pictures that went with the text were very nice, but bore little or no relativity to the text before or after. Why? Thank you for the great post and advises! I’ve never thought of adding radicchio to risotto — I’ll have to try this, if I can wrench myself away from the baby artichoke / asparagus / fava bean / fennel themes currently dominating my springtime cooking. Thanks for the inspiration! I sometimes use my leftover risotto as the bottom layer of a frittata, in lieu of leftover pasta or thinly sliced potatoes. Works great that way, since the texture isn’t front and center. Risotto can be annoying to make if you have guests, especially when it’s a first course and you have to spend 20 minutes concentrating on it. I find that cooking the rice to (roughly) the midpoint of the recipe works well and as you suspected, increases the creamy texture of the rice, but it will finish faster becuases it’s had time to absorb the cooking liquid. Most Italian cooks use a broth that’s made of the bones of various animals, and sorry, but I find the turkey stock idea profoundly odd. Since the liquid both evaporates and concentrates in the rice, the French version of stock sounds too strong. Ham stock is great, btw. Restaurants add a lot of butter to finish theirs, but home cooks don’t need to, especially if the risotto is the main course. And seriously, add whatever grated hard cheese you like and serve more on the side. Imported rice can languish on the market shelves, so I recommend buying either Arborio or Canaroli from places with high turnover. Lundberg grows a good version of the short-grained rice here in California. Old rice grains can break down instead of retaining their shape. As for leftovers, my Piedmontese grandmother used leftover risotto to make croquettes for lunch the next day. Plus plain risotto is the main ingredient in deep-fried arancia and suppli al telephoni. Thank you for the tips! I think I make a good risotto but I’m never quite sure what a pro would think of it. Perfect spring dinner! And I even have turkey stock that I made this winter. Thanks for the inspiration. The kids on Top Chef always get in trouble for not having ‘loose’ risotto that naturally spreads to cover the bottom of the bowl…seems there are several schools of thought regarding correct consistency. Not that Paul Bertolli needs my endorsement, but I second his recommendation of turkey stock. I don’t make risotto often as I find white rice pretty blah, but I did make some last week using my own turkey stock and it definitely had more pow than with chicken stock. I’m somebody else about to be dragged away by the risotto police, however, as I make mine in the microwave. So much less stirring and it comes out if anything better than the stovetop version. Is bacon easily found in Paris? When I was was visiting in December I couldn’t seem to locate it. I thought perhaps it was one of those hard to find things like peanut butter! “My Paris Kitchen” arrived in my mailbox this morning and I spent the rest of the afternoon turning page after page. Thank you for this amazing journey. I’m going to enjoy this for a long, long time. 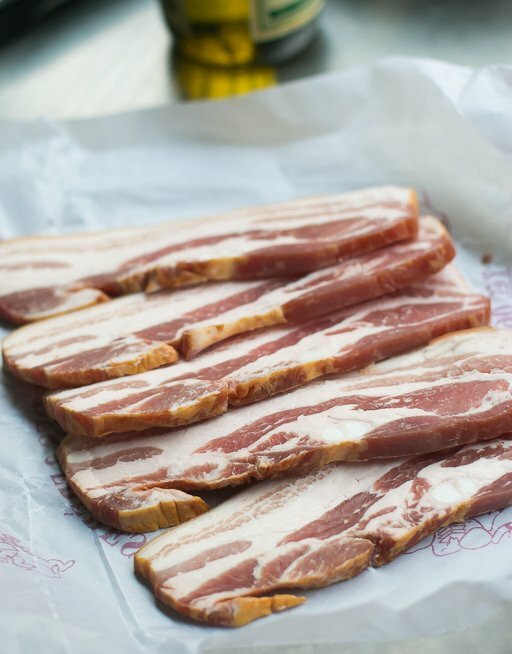 Amanda: Bacon is poitrine fumée and is easily found at just about every charcuterie, some butchers, and every supermarket. 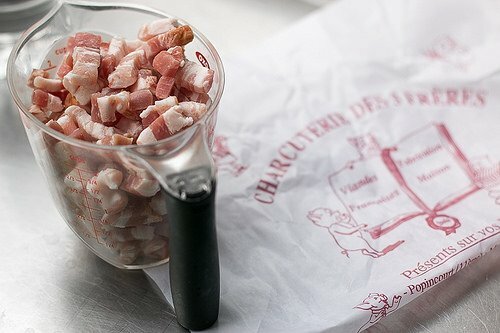 It’s used so much, you can buy it cut into batons – which can be cooked easily and added to, well, anything… – called lardons, too. Gavrielle: Some people swear by making risotto in the microwave. I’m sure it works well but I don’t like not being able to watch things as they cook (which is why pressure cookers don’t really do it for me either) – but I know people report having great results in the microwave. Barbara Kafka is a big proponent of that method. I am not sure why you would think adding asiago or risotto is inauthentic – they are two italian cheeses, and two amazing italian cheeses, at that! Sure, it might be more common to finish with Parmigiano or Grana but, truth is, most Italians in their kitchen do whatever they want and just do not tell. It is beyond me how some (a lot) Italians can enjoy putting Wiener sausage in their pasta – especially the crappy ones that are on sale in Italy, yet many of them do. The Italian police would also be here to tell you that you should have used Pancetta, or smoked italian pancetta – but poitrine fumè is delicious, and everyone has got to make do with what they have. That said, this dish is amazing! AH! the book! the book! such a beautiful book, David! love all the commentary especially…so enjoyed the post about writing it too… zowie! had NO idea!!! have been meaning to ask – some years ago a friend and I were in Paris and shopped at a supermarket for some great French take-homes…. one was a rather inexpensive cocoa that turned out to be some of the best… sadly I can’t remember the name (hoping to ask other friends to shop and smuggle for me!) but it seems it was something like 1812…. bells ringing? thanks for showing up in my e-mail with such regularity! it’s a delight!!! Has anyone used sushi rice in place of arborio? I just got home from the store and realized that I accidentally picked up a container of sushi rice versus the arborio! Will it be a glutinous mess? those are the prettiest lettuces i’ve ever seen photographed! Only NYC residents can enter the Tasting Table event?? In addition to Parmesan cheese, I add some mascarpone at the end which makes creamy risotto. I pre-ordered your book on amazon.fr and it arrived on day 1. A real labor of love, David, congratulations. Stories, as well as recipes, are great. I’ve become bored with cooking, but I think your book will motivate me. Mille mercies! I think you should add the print function, don’t go back and change the prior recipes that don’t have the print function, and ignore the complainers. I once had a tennis coach who switched my grip to continental. I resisted. It was going to be a lot of work.. He said “You can do this now, and in a year you will be a better tennis player. 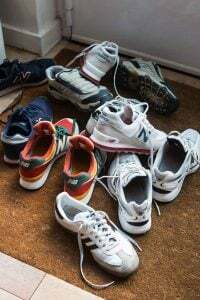 Or you can not do this now, and in a year you will be the same tennis player”. Ignore the past and start the print function! Dear David, radicchio and bacon is a very good flavour combination. I always heard from cooks, mother, grandmothers, that the very last step in risotto making is very important to have a creamy risotto. It’s the “mantecatura” (n. 7), when you add some fat – cheese (parmesan or another one… ever tried taleggio?) or butter -, when the risotto is already al dente, just 1 minute before serving. Oft some chopped persil is added, just over the risotto in the bowl. You know, we italians like aromatic herbs (basil, oregano, marjoram etc.) in the kitchen. I’m waiting for My Paris Kitchen, I’m looking forward to read your new stories and recipes! Have a nice week! Ok I made it! It’s delicious! may be more watery than those in France I gave the radicchio a good squeeze in paper towels similar to a spinach treatment after chopping. I appreciated your light treatment of butter and cheese. Rustic after for true Tx atmosphere! 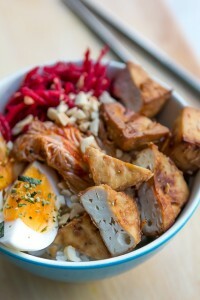 Thnx for the above recipe esp the info about the different type of rice to use…will head to Berkeley Bowl to get some. BTW, my husband and I were just at Oliveto’s last week (downstairs) and we had the risotto. (excellent as usual) It looked different…a darker rice and of course I forgot to ask what the difference was…any thoughts? If I show up at the book signing in SF on May 9th will they have enuf books for you to sign or should I bring a few with me? I don’t know what rice Oliveto’s uses but you could certainly ask. They may source a special kind of rice but they’re pretty nice there and open about their ingredients and where they source them. Happy you’re coming to the book signing. I don’t know how many books that each venue will have on hand so it’s best to call or contact the shop or venue. Some places will let you bring in books published elsewhere, others want you to buy the book there. It’s nice to support the venue/shop, but an event I did last week sold out of books before I even got there (!) so best to ask them to make sure. David, you’re right. The type of beans used in cassoulet now are native to the New World, not Europe. Fava beans are Old World beans, as are chickpeas and lentils. But green beans and most dried beans — kidney, pinto, cranberry, all those types — were imported after 1492. Chiles, tomatoes and potatoes are also New Worlders. India and Thailand didn’t have hot chiles until after Columbus. Amazon just delivered your new Book David, very exciting. I’m making this risotto for my clients tomorrow. See you in Berkeley. Delicious sounding recipe! And actually, that is radicchio. There are so many kinds of radicchio, which are all varieties of chicory. This type is similar to one grown in the Veneto, where many of the sweeter versions hail from. All are great in risotto. To make this recipe even easier, I think you could slice the radicchio into ribbons and just at it at the very end, to wilt in the rice. I do this all the time with greens like arugula, chard and spinach. And don’t worry about what kind of cheese you use. Depending on the region and what kind of risotto you are making, parmigiano is never a given. 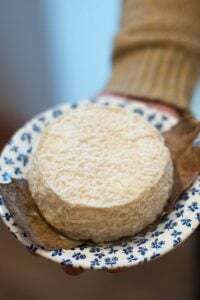 A good pairing with radicchio that you find in the north is gorgonzola dolce, a creamy version that is stirred in at the end, after the pot comes off the heat. Lots of handy tips in this post (and comments). This recipe caught my eye because it reminded me of the best risotto I’ve ever had. It was cooked by a friend in the north of Italy and featured radicchio and scamorza affumicata. I imagine using a smoked cheese would bring a similar quality to the risotto as using a smoked bacon. And suitable for vegetarians. Turkey isn’t very popular here in Australia but it’s starting to appear more in supermarkets. I’ll have to try making the stock. And as a big fan of Gorgonzola, I like Elizabeth’s suggestion above! @ Michael: Dear, dear Michael, Kentucky Boy…. 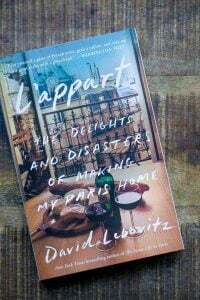 you SO beautifully thanked David for his Paris book (I wish I could express myself so eloquently!) and then you spoil it nearly by asking for the correct prononciation! Don’t you worry your head about this, pronounce it proudly in any way you can – the others won’t know better either. I’m thankful that we get the Fahrenheit AND Celsius degrees however! Sorry David, that I replied to Michael, but his post made me smile and head bobbing… You’ve got loads and loads of fans all over the world and you don’t even need your own TV show, thanks Goodness for that! Another great rice to use for risotto is Vialone Nano if you ever come across it. Many people, Lombards specifically, swear by it. I just tried this recipe. It was my first risotto as well. Turned out great. Thanks for the inspiration David! Mmm . . . making paella this week, which is a near-cousin to risotto. And if there are any leftovers, supplí! I made this risotto recipe this past weekend and even used my Turkey stock (frozen since Thanksgiving)! I am sorry to say that the 8 C of Radicchio overwhelmed the other flavors to the extent that the dish was terribly bitter. I think 4 C or one head might have made more sense. Perhaps the duck inclusion in your rendition masked the bitterness? @Judith, could it have been a different kind of radicchio? I don’t know where you live, but what we get here in the US seems to be a lot tougher and more bitter than what we found in France. What David pictured looked more delicate and lettuce-like than the cabbage-like, tough look of the stuff here. I’ve really never been a fan. I used the greens (or reds?) shown here, plus standard radicchio, the tight heads, with good results. 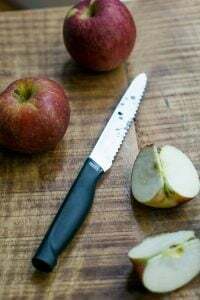 However produce can differ and perhaps some varieties available, depending on where you live, may be more or less assertive. So best to taste, and add according to your preference or what’s available.